10/01/09 UPDATE: I have since discovered that these biscuits are even better with buttermilk. For more information and a tutorial with photos, go to this post. I'm not really one to celebrate or memorialize things, but this here is post number 500 on Dejamo's Distracted. I've been blogging since August of 2005. While I was not exactly a pioneer in the blogosphere, I can claim some chops for longevity. And while the world certainly may not have needed another knitting blog, I guess there can't be too many food and cooking blogs. Not long after I left home, I found a biscuit recipe that was pretty much fool-proof. It was extremely easy for the novice baker I was at the time, and the biscuits always came out light and fluffy, with that unique biscuit flavor. I made them so often that I no longer needed the recipe. Which was unfortunate, because inevitably, as so often happens, I stopped making them regularly. And then I stopped making them at all. By the time I was ready to make them again, I no longer had the recipe memorized, and I had no idea where the written copy was. It wasn't in my regular recipe box, nor in any peripheral recipe pile or stack. I didn't even remember from where the recipe had come. I tried the recipe I did have in my recipe box, but it fell flat. Either my skills had changed, or there was something particular to that recipe, but none of the recipes I tried after that worked. Maybe those biscuits had grown in my memory over the years, but nothing even came close. While I was thumbing through the Tassajera Bread Book again, I came across another biscuit recipe. I copied it down and put it in my files, but I never got around to trying it. I rediscovered it recently and decided to give it a try. I was very pleased with the results. More pleased than with any of the other recipes I've tried over the years. These aren't so much light and fluffy as light and flaky, which makes them better to my mind. And the whole wheat to all-purpose flour ratio is perfect. I use whole wheat white flour, which helps keep it light. I will probably experiment and increase the whole wheat to all-purpose ratio, perhaps even going all whole wheat if I can make it work. What makes these biscuits stand out is the rolling method. After a quick kneading, they're rolled and folded, turned, and rolled and folded again three times. Don't omit this step - it's what makes the biscuits so flaky. I tested these about a month ago. I've since made them every week. They are fast and easy, and come in handy when I don't have any bread on hand and need something to go with eggs at breakfast or soup at lunch. They are particularly good with a fried egg laid over them, like a poor man's Eggs Benedict without the Benedict. 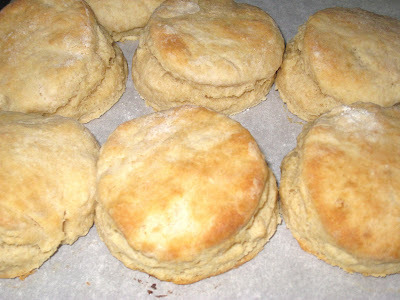 One batch makes a good 12 to 15 biscuits. All biscuits are best fresh out of the oven, so I have taken to cutting the recipe in half when I make it. If you aren't going be using most of the 12 biscuits right away, I would suggest you do the same. I also don't usually go to the trouble of cutting out the biscuits, then rerolling the scraps, and cutting out more. Especially when I'm making a half-batch, I just cut the rolled out dough in half lengthwise, then in thirds crosswise so I have six square biscuits. Quick and easy, and they taste just as good. There is much argument over whether one should use butter or shortening in biscuits, piecrusts, and other pastry products. The general issue seems to be that butter, while flavorful, will not produce as flaky a product as shortening will produce. Shortening has partially-hydrogenated fats (trans fats), and my (granted, one-time) use of the shortening that does not have trans fats was not successful. (And those products actually still have trans fats, they just have less than the .5 gram limit allowed by the FDA. Check the label - it will still show partially hydrogenated oils.) Which should you use? I would say it depends on your preferences. I know my original biscuit recipe used butter (and at the time, I would have been using margarine). The differences seem to be that butter is more flavorful, but can be more tough and will not be as flaky. Shortening has less flavor but will be lighter and more flaky. I have been using butter, for both my biscuits and my pastry dough, and I have no issue with the flavor and the flakiness. You may feel differently. If it matters to you, experiment and use whichever gives you the end result you like the best. I suppose the true test for me will come with our old family peanut butter cookie recipe, which calls for shortening and I haven't made since I stopped using shortening. I'll get back to you. 2/7/10 UPDATE: After recently acquiring some hand-rendered lard, I made a batch of biscuits using it instead of the butter. They were the best so far - still tasty and flaky, and super tender. If you can get hold of some, you should definitely try it. Also, if you use buttermilk instead of milk, the biscuits rise a little higher if you add 1/2 a teaspoon of baking soda. Combine flours, baking powder and salt. With a pastry cutter, cut butter into the mixture until the butter is pea-sized. Make a well in the center. Add the eggs and milk. Beat the eggs and milk until smooth, then stir to gradually incorporate the flour and butter mixture until all is moistened. Do not overwork. Turn the dough out of the bowl onto a floured board or the counter top, then knead the dough just enough to bring it together. If the dough is really sticky, add more flour as you are kneading it, but just enough to keep it from sticking to your hands or to the board as you are rolling it. Roll the dough into a1/2-inch thick rectangle, then fold in thirds. Turn dough a quarter turn. Repeat rolling, folding and turning process two more times. Roll dough to 1/2-inch thickness. Cut into rounds with floured cutter or glass, or cut dough in half lengthwise, then into six pieces crosswise. Place on ungreased sheet and bake at 450 degrees for 8-10 minutes until bottoms are browned lightly and tops are slightly golden. Hooray you! Sorry I was out of town and couldn't celebrate in a more timely fashion. Brought back some new spice blends from the Current Middle Ages. More as they get used. Thanks, Misreall. Can't wait to hear about Pennsic, and what you do with the spices. What's your schedule looking like? The JC dinner looks like it isn't gonna happen, but maybe we can get together soon?